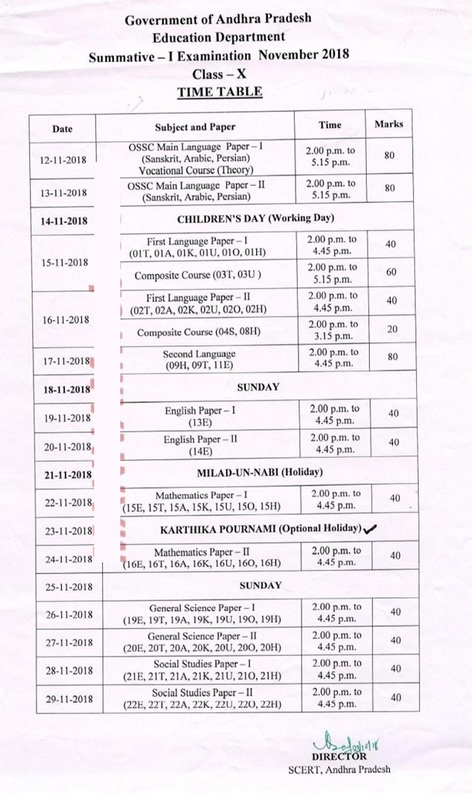 Time Table for SA 1 Summative Assessment in Andhra Pradesh AP SA-1 New Time Table 2018-19 AP SA1 EXAMS TIME TABLE FOR 2018-2019 for Primary,Upper Primary,High Schools-Conducting Guidelines For HMs, MEOs, Teachers for SA1 Exams: AP SA-1/ SA1/ Summative1/ Summative Assessment1/S.A1/S.A-I/S.A-1 Examinations : Revised/ Modified/ New Time Table 2018-19 Rc 3 PS/UPS/HS(Primary UP High Schools). Implementation of the Examination Reforms and communication of the Time table for conduct of Summative Assessment-1 in all the Schools of Andhra Pradesh. AP SA2/SA2/Summative2 Exams Timetable For Primary Schools i.e 1st, 2nd, 3rd, 4th,5th Classes. AP SA1 (Summative1) Exams Timetable for Primary,UP,High Schools . AP #SA 1 Exam Dates, Summative I Exam Time table 2018, SA 1 Question Papers,Primary / UP/ High School SA 1 Time table Copy Download.AP SA 1 Revised Time Table 2018-19 #Syllabus, Summative 1 New Dates for Primary/ UP/ High Schools 2018. Summative I Exams 2018. 1st, 2nd, 3rd, 4th, 5th, 6th, 7th, 8th, 8th, 9th and 10th Class SA - I Exam dates. SA 1 Model Question Papers Download. సమ్మేటివ్-1 పరీక్షల షెడ్యూల్ను ఎస్సీఈఆర్టీ విడుదల చేసింది. 6 – 10 తరగతులకు నవంబరు 12 నుంచి 27 వరకు పరీక్షలు నిర్వహించనున్నారు. 1- 5 తరగతులకు 22 నుంచి 27 వరకు పరీక్షలు జరుగుతాయి. For classes IX and X: 2.00 PM to 4.45/5.15 PM.Sessions without exam should not be treated as a holiday. Study hours are to be conducted with the respective classes for the following day’s exam duly engaging the concerned subject teachers. Any deviation is not entertained. Note: Exam Timings for classes VI, VII and VIII : 10.00 AM to 12.45 / 1.15 PM & For classes IX and X : 2.00 PM to 4.45 / 5.15 PM. 2. VIII class Science has two papers (Paper-I Physical Science, Paper-II Biological Science) and remaining all subjects has one paper each. Main Key Points In Rc.No.3 For Conducting SA-1 Exams 2018-2019 Academic Year are as follows. ∎For Primary level is from 22-11-2018 to 27-11-2018. ∎For High School Level SA-I Examinations is scheduled from 12-11-2018 to 29-11-2018. ∎As it is common examination across the State,conduct examinations as per the schedule without any deviation. ∎In this regard all the RJDSEs,District Educational Officers in the State are requested to communicate Examination Schedule to all Schools and under all Managements in their respective districts and also follow the guidelines as mentioned in annexure. ∎All the District Educational Officers in the State are informed that as per reference citied. ∎SA-I examinations to be conducted for class VI, VII and X in descriptive type. ∎And For classes VIII and IX in OMR enabled objective type examinations. ∎Class VI, VII and X question papers printed and supplied to all schools by the DCEB Secretaries in the concerned districts. ∎Class VIII and IX objective type question papers and OMR sheets print and supply by Director, Government Examinations, Andhra Pradesh. ∎In this connection all the District Educational Officers in the State are informed to conduct meeting with all MEOs and Dy.EOs.,on the guidelines issued by SCERT for conduct of SA-I examination which is scheduled from 12-11-2018 to 27-11-2018 in all the schools under all managements without any deviation. ∎Prepare clear roadmap for conduct SA-I examinations without any malpractices. 1. All the Head Masters of all managements are here by informend that all the MRCs of all Mandals are arranged as Key Centres under the supervision of Mandal Educational Officers. 2.The Mandal Educational Officer is held responsible to keep all these Question papers and OMR sheets in the strong room. 3.The Mandal Educational Officer should inform all the School Complex Headmasters to receive Question papers one day before each examination. 4.The Mandal Educational Officer should not give all the question papers at a time to school Complex Headmasters. 6.The school complex Headmaster should collect question paper and OMR sheets one day before the examination. 7.The School complex Headmaster preserve the Question papers in iron safe. 8.The school complex Headmaster distribute Question papers and OMR sheets to all the schools one hour before the examinations by utilizing the services of cluster Resource Person. 9.The school complex Headmaster is held responsible to maintain strict confidentiality. 10.This should be done every day by the school complex Headmaster till the completion of the examinations. 11.Headmaster is the first level monitoring officer for smooth conduct of summative examinations without any deviations. 12.Headmaster should verify seals of the question paper bundlels at the time receiving from the Cluster Resource Person. 13.If the Headmaster identify any damage to the seal of the paper bundle communicate the information to MEO. 14.After Completion of every day examinations the OMR sheets should be neatly packed by the concerned school Headmaster without any damage and submit at OMR receiving cell in the Mandal Headquarter. 15.The Head Masters are responsible for safe custody of the Question Papers bundles, Question papers bundle is to be opened 15 minutes before the commencement of the examination every day. 16. The Head Masters are requested to attend in their respective MRC to verify the adequacy of Question papers and to be preserved the Question paper bundles in their own trunk boxes. Search Tags: SA1/Summative1/Summative Assessment1/S.A1/S.A-I/S.A-1 Examinations Revised/Modified/New Time Table 2018-19 Rc 3 PS/UPS/HS(Primary UP High Schools).Director SCERT has released Summative -I Exams Time Table for 2018-19 for Primary, Upper Primary and High Schools. SCERT, AP, Amaravati - Implementation of Examination Reforms -Summative Assessment I Time Table for Primary level Download SA-1 Examinations Timetable along with Instructions For High School Level.